Get the powerful benefits of CAT® VisionLink technology when you rent a Cat VisionLink-equipped machine from Wagner Equipment Co.’s rental fleet. You’ll get more done when you have real-time insight into the machine’s location, idle time, fuel burn, stop-start time and operator performance. Plus, it’s all available at no additional charge to you. OPTION 1: Send me the Information. You will receive a weekly email report showing the total hours the rental machine was used each day. This report outlines run versus idle time. 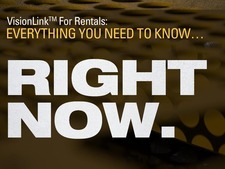 Gain insight to help you decide to extend or return the rental. Reduce your fuel costs by addressing excessive idle time. OPTION 2: Give me the full power of VisionLink technology. You will receive a user ID and password to log in to the VisionLink website or mobile app to take advantage of powerful equipment management tools. Reduce time looking for the machine by seeing its location. Improve productivity by addressing first hour/last hour production. Address operator events before they result in damage charges. Improve fuel management by knowing the fuel level in the machines. Set time and location boundaries to know if a machine is operating outside your plan.